I’d like to wish everyone a very Happy Yennayer! Today marks the beginning of the year 2966 to the Amazigh. Amazigh are a group of people, sometimes incorrectly referred to as Berber by others, that live in the countries of Algeria, Burkina Faso, Egypt, Libya, Mali, Mauritania, Morocco, Niger and Western Sahara. 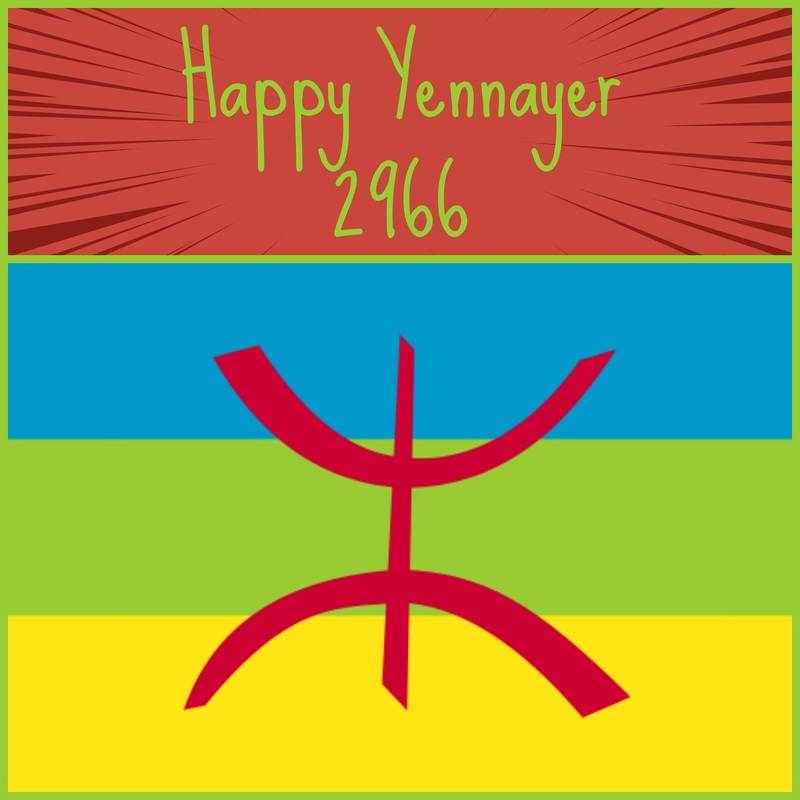 Yennayer is the first month of the Amazigh calendar. There are some academics that are still trying to figure out the origins of today’s celebration. The Amazigh lived the land before the Arabs arrived and still cultivate a vibrant culture, calendar, language, cuisine and even a flag. yellow represents the sands of the Sahara Desert. The yaz symbolizes the “free man”, which is the meaning of the word amazigh. It is in red, the color of life, and also the color of resistance. There are 36 million Amazigh people in the world. Morocco has the highest population at 20 million. Unfortunately their language is disappearing. Although Libya boasts a population of 600K Amazigh, my first memory with an Amazigh was in America when I was a small child. My parents were getting their Master’s degrees in Oklahoma and they had heard a new Libyan couple had moved into our town. What I remember most about our first visit (of many) was how stunning the language was when the mother spoke it. The first time I heard it, I was mesmerized by how her mouth used every muscle to make those sensational sounds. I remembered leaning over to my mom and asking what she was saying to her kids. I thought that maybe being away from Libya for a few years had made me forget some Arabic words. My mom said she had no idea. I was shocked because I had been told we were visiting Libyans. How can a Libyan not be able to speak to another Libyan? Once I learned more about this family and the Amazigh that we had in Libya, I tried to spend as much time at their house as was possible, just listening to the mom and that beautiful language. While Berberism is a political discussion that I’m not ready to have with my kids quite yet. I can still share with them that I think it’s fantastic that in 2008, Libya officially celebrated the Amazigh new year. Now, Morocco just needs to follow suit.